445 and 446. D’Ectol’s oscillating column, for elevating a portion of a given fall of water above the level of the reservoir or head, by means of a machine all the parts of which are absolutely fixed. It consists of an upper and smaller tube, which is constantly supplied with water, and a lower and larger tube, provided with a circular plate below concentric with the orifice which receives the stream from the tube above. 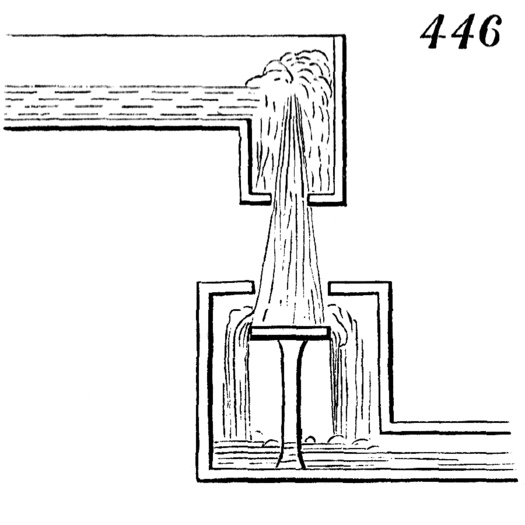 Upon allowing the water to descend as shown in 445, it forms itself gradually into a cone on the circular plate, as shown in 446, which cone protrudes into the smaller tube so as to check the flow of water downward; and the regular supply continuing from above, the column in the upper tube rises until the cone on the circular plate gives way. This action is renewed periodically and is regulated by the supply of water.